Glorious glorious ginger. I must admit, as a child I didn’t enjoy ginger, its woody fibrous texture and sharp flavour were too much for my dainty taste buds … but now as an adult, a day without ginger is a day not worth living. My mama would cook ginger in various ways, and now I yearn for the fragrant zing that filled our house when sliced ginger was gently fried to release this rhizome’s aroma. My folks both studied pharmaceuticals in their college days, and even though they currently don’t practice there was a presence of herbal medication in our home. My mama would always speak of ginger being so good for you, that it prevents colds, or helps you heal up when you’re struck with flu … and you know what? She’s right. 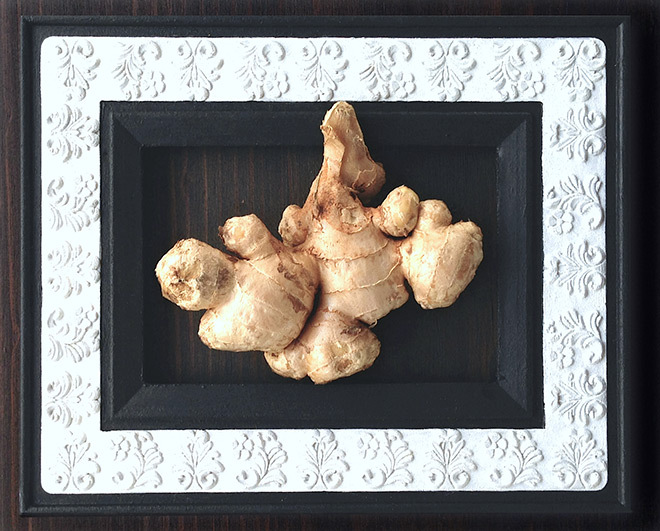 Ginger is not only used as a flavour and preservative in food but also as medicine in Asian cultures. Originating from the tropical jungles of southeastern Asia, ginger is actually not a root but a rhizome (also known as a creeping rootstalk – a horizontal underground-growing stem that creates both lateral and adventitious roots). It thrives in the lush greenery and humidity and is harvested in the cooler seasons. When I stayed home sick, mama would poach peeled pears in water, palm sugar and plenty of sliced ginger. The name derives from a Sanskrit word ‘sringavera’ which means horn-root, describing its appearance. From Confucius’ daily intake recommendation in 5000 B.C. to Queen Elizabeth I’s claim of inventing the gingerbread man recipe – this ancient ingredient has been mentioned all over history for its flavour and health benefits. But just how good is ginger for you? Unlike the west, herbal medicine practice was always visibly present in the east and is a fine and sophisticated science. In Asia, the entire ginger plant is used, separately for their unique functions (leaves, peeled rhizome and the mature root skin). Traditionally ginger is well known to alleviate gastrointestinal discomfort, and a herbal remedy for inflammation. It boosts your immune system by promoting healthy sweating which releases germ-fighting agents. So, if you need a good detox, consume ginger … and you can enjoy the added benefit of a stronger immune system. Available all-year round which makes it extremely accessible, ginger is also loaded with Vitamin C. And for that reason ginger was consumed in 5th century AD by Chinese sailors to prevent scurvy. In addition, ginger stimulates the production of saliva (encouraging an appetite), reduces nausea and has an anti-vomiting effect. Plenty of studies have been done on ginger’s health benefits, finding that it contains antioxidants and produces active phytonutrients that have an anti-tumour effect on cells. Ginger is also quite concentrated with active substances which means you really don’t need much to obtain the benefits. So let’s call ginger what it is – a superfood. Charring adds a wonderful smokiness to ginger, adding complexity to a soup, broth or sauce. 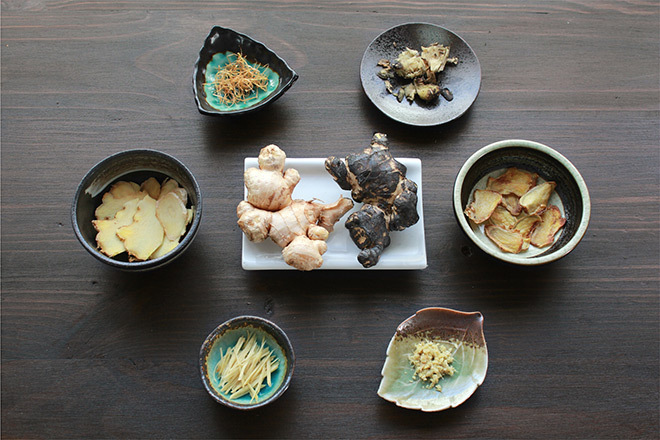 Here’s how to char ginger. 1. Get a pair of metal tongs out, char it over a flame and then add it into your base. The flame of your gas stove works perfectly. I prefer to let the flavours release faster by then giving it a bash or two in a pestle and mortar and allow the flavour to infuse into the meal, cooked over heat. Grating ginger and letting it fry gently in oil/fat before adding your meats and vegetables allows the ginger flavour and aroma to seep into the oil. A common combination to add to this style of ginger is minced garlic, spring onion slices and chopped chilies. You can also use ginger slices if you enjoy the texture of the ginger, like a family favourite – 3 Cup Chicken. Raw ginger has a sharp zing that’s dulled out slightly when roasted but this is quite desirable in a sauce of sharp vinegars, soy and chopped chilies. A complementary companion for most dumpling-type dishes – you can also use this mixture to add more flavour to a bland congee. Ginger is fantastic in tea, and there’s no need to peel it. You can break a section off, slice it up and add it as is. My current favourite combination is rooibos, a few slices of ginger, honey, Eugenia berries (the little, pale pink berries found on brush cherries – note: not all are edible), squeeze of grapefruit juice and a little grapefruit rind. Fresh ginger doesn’t taste like dried ginger, with dried ginger being spicier than its former fresh self. Dried, ground ginger is highly accessible and a popular ingredient in marinades. Dried ginger still offers a variety of health benefits. You need about one teaspoon of ground ginger for every four tablespoons of fresh ginger. 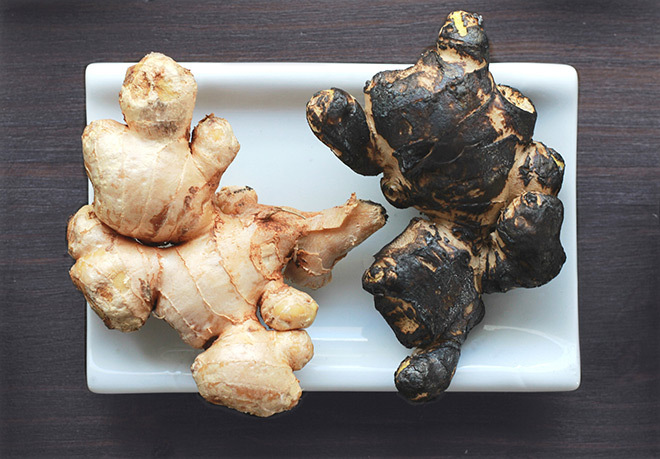 Underrated and easily accessible, ginger is truly wonderful in both nutrition and flavour. So, why not experiment more with ginger this cold season? Like learning about the foods you cook with and how you can get more out of the culinary experience? Sign up to our newsletters to keep on top of the food trends.